This report is a guide to the development of model smart growth ordinances, including models that may be adapted by local governments to implement special planning policies for multimodal transportation, infill development, affordable housing, and other best practices in planning and development regulation. As used here, "smart growth ordinances" and "smart growth development codes" mean regulations intended to achieve a variety of objectives, including encouraging mixed uses, preserving open space and environmentally sensitive areas, providing a choice of housing types and transportation modes, and making the development review process more predictable. 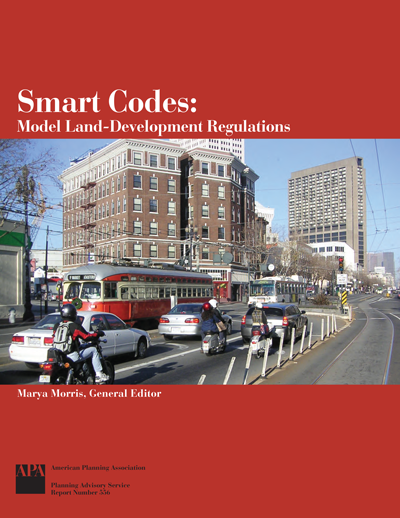 Local policymakers, such as mayors, city council members, and planning commissioners, can use this report to familiarize themselves with the contents of land-development regulations; alternative ways to update such regulations; methods to incorporate smart growth objectives; and particular types of smart growth ordinances. Professional planners can use this report to assist policymakers in understanding both land-development regulation and the formulation of ordinances meeting smart growth objectives.